This is something new I learnt these days. This DIY project differs a bit from anything I have done this far. I’ve been dreaming of making a bonsai tree for a long time, but all the techniques for making flowers or leafs were too complicated. Some people offered making them from beads, while others suggested crocheting them. Finally, I have found a great and easy way to make these flowers. It took me only 15 min to make 10 of them. Guess what they are made of? It’s very green and upcycling thing to do. I’ve make them out of a plastic bottle! I think they look nice. Here is what I’ve done. I have cut out ‘flowers’ with three petals from a white plastic bottle. Then I used a thick needle, heated it up over a candle and pricked a hole in the middle of a flower. Keeping it on the needle, I put the plastic bottle flower over the candle heat to get it shaped the right way. 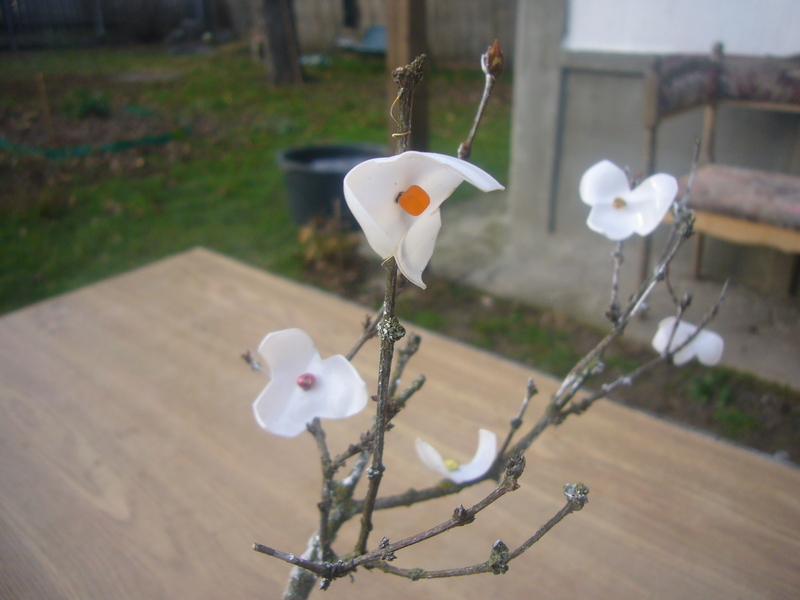 Then I removed the needle, used some thin wire to put the bead inside the flower and for fastening it onto the bough. I had an old glass mug in my home. It’s veteran mug, it survived for 8 years in a home with two small kids. Finally, it got cracked, but I was sorry to throw it away. I had a piece of old vintage looking lace to use in my bonsai tree DIY project. I glued the lace over the mug using PVC white glue. 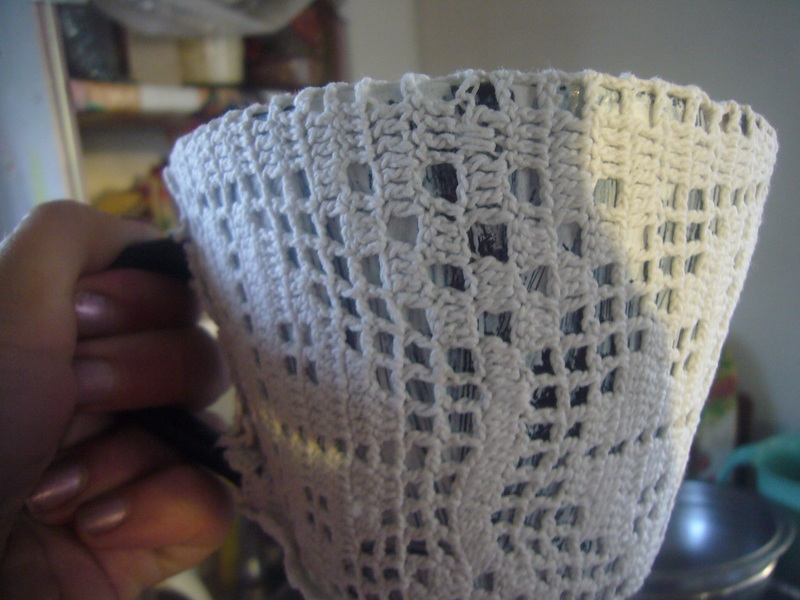 I sort of decoupaged the mug with the lace, as I’ve done it with my crocheted jar. Finally, I have painted the bough with some silver paint to give it a frosty look. 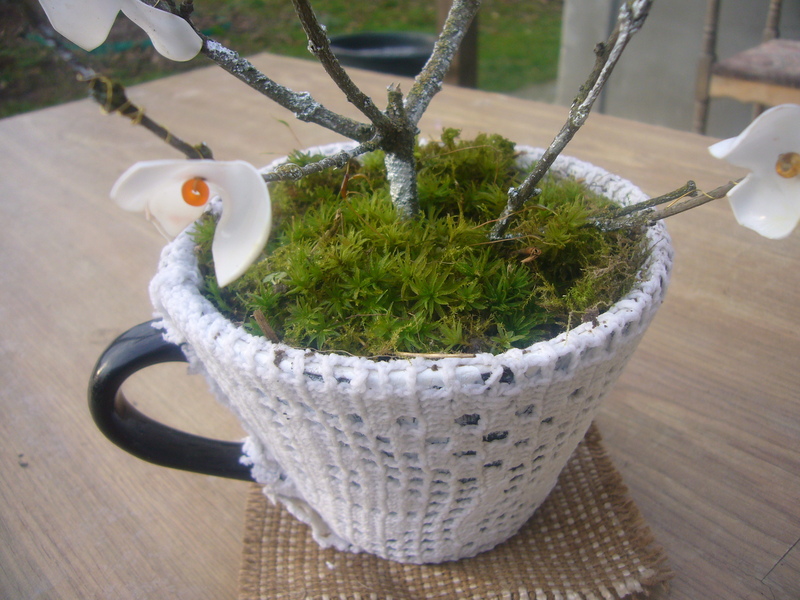 And, I’ve gathered some moss to put in the mug. I believe those plastic bottle flowers look great and they offer much space for your creativity. Plus, they are eco friendly and it’s a great upcycling idea. 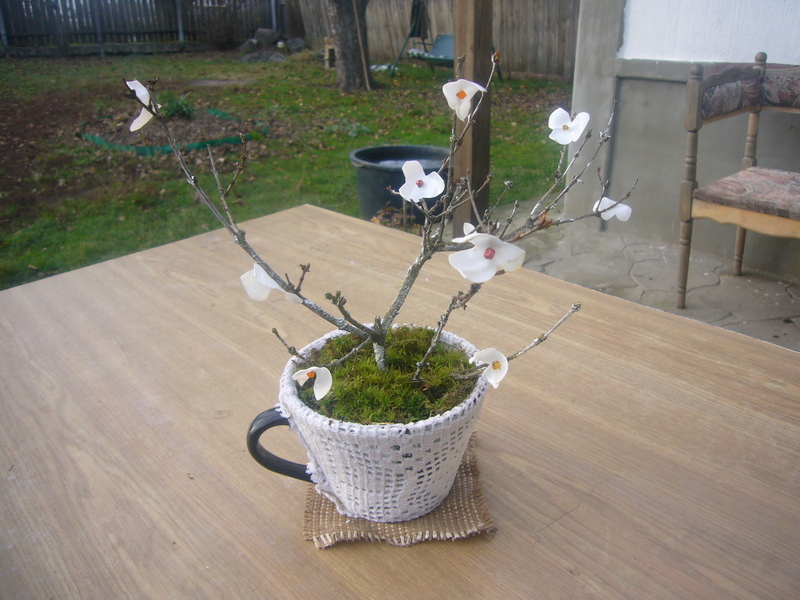 This entry was posted in Crafting Tutorials, Decoupage ideas, Uncategorized and tagged bonsai tree, crafts, creative, cup upcycling, DIY, easy crafts, handmade, home decor, home deocr, old mug upcycling, plastic bottle bonsai, plastic bottle flowers, upcycling. Bookmark the permalink.